Police, in co-operation with Citywatch CCTV operators in Lisburn, took action last weekend when a gang of organised beggars were spotted in the city centre. 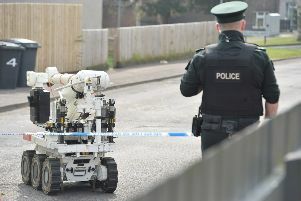 During the afternoon of Friday April 29, CCTV operators noted the gang begging in the Bow Street, Market Square and Graham Gardens area of Lisburn city centre. Police were tasked to the two males and one female, who had wrapped themselves in blue sleeping bags with a coffee cup to collect the money from passers-by. After being dealt with by police the CCTV operators were shocked to see the persons, who had been disrupted by the officers, produce a large wad of notes from their pockets and all three then got onto a train back to Belfast. If you have concerns about criminal activity taking place in Lisburn city centre, police can be contacted on the non-emergency number 101.